Create longer-lasting ID cards that better resist forgery and alteration. The CD800™ laminating ID card printer with inline lamination module helps you protect your ID cards from abrasion, chemicals, daily wear and tear – and fraud. 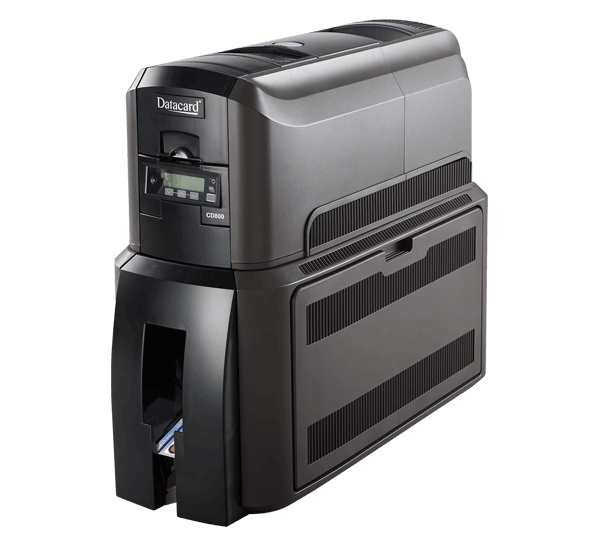 In addition to outstanding security and durability, get faster printing, more reliable performance and the highest print resolution available in a desktop card printer. Offering one of the broadest feature sets of any card printer, the incredibly versatile CD800 printer with lamination is ideal for the most demanding secure ID applications including government ID cards, corporate access cards, multi-application college ID cards and more. Find downloadable resources you need to support your Entrust Datacard card printer. Bolt-down ready laminator and mechanical locks secure the laminator, printer, card stock, sensitive supplies and rejected cards from theft. A concealed output hopper is also available to protect the data on finished cards. Organizations including government agencies, corporations and education establishments face serious and escalating security threats.